Last year's big winner to the MMFF 2013 was Robin Padilla's 10,000 Hours where he won the best actor trophy. In this year's Metro Manila Film Festival (MMFF 2014), Robin Padilla will once again give his best to take home the best actor award for his filmfest entry, Bonifacio: Ang Unang Pangulo. Together with a roster of new and veteran talents, Bonifacio: Ang Unang Pangulo is also one of the well-deserved movies to watch out for this Christmas season. 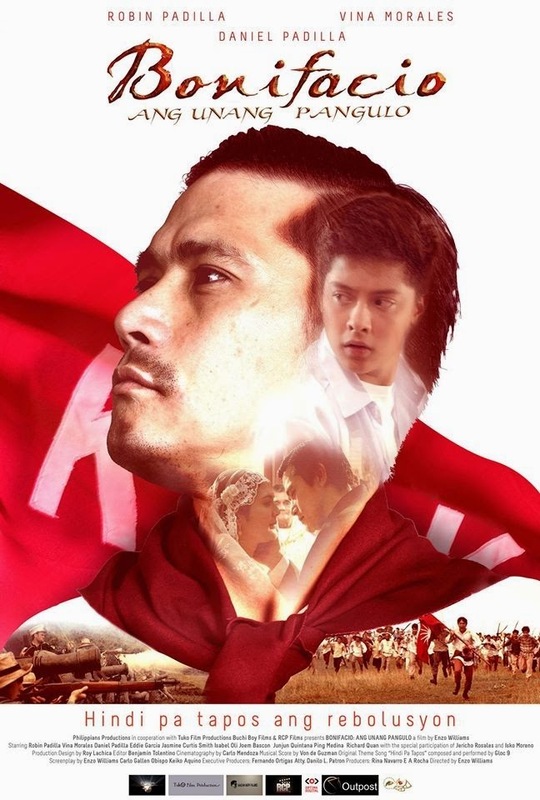 "Bonifacio: Ang Unang Pangulo" is a historical action biopic that brings to light the powerful, true-to-life drama of Filipino revolutionary Andres Bonifacio (played by Robin Padilla) — one of our country’s national heroes — with his virtues and humanity, unfolding through the eyes of a young man (Daniel Padilla) in this day and age. The movie also stars Vina Morales, Jasmine Curtis-Smith, Daniel Padilla, RJ Padilla, Cholo Barretto, Jun Quintana, Joem Bascon, Isabel Oli, Richard Quan, Ping Medina, Vice Mayor Isko Moreno, Rommel Padilla, Dennis Marasigan, Jericho Rosales, and Eddie Garcia. The movie is produced by Philippians Productions Inc. in cooperation with Tuko Film Productions, and Buchi Boy Films. An impressive line-up of screenwriters were hired to do the script of this movie, which include Keiko Aquino, Carlo Obispo, and Enzo Williams. Enzo Williams also directs this film. "Bonifacio: Ang Unang Pangulo" is one of the MMFF 2014 entries that is set to be shown on December 25. Below is the full movie trailer of "Bonifacio: Ang Unang Pangulo."